Heelwork to music / freestyle workshop - this is the most popular workshop which has been developed over the many years Richard has been teaching. These workshops can be a basic course for handlers that have never done the sport or if the handlers are competing then this allows Richard to extend their training and give them other ideas for moves etc. 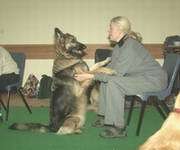 The best amount of handlers on a course is around fifteen as this is a manageable amount and allows Richard to spend a bit of time with all handlers individually as well as doing the group work. Richard says "my thinking is that if the handlers and dogs do not go home tired I have not worked them hard enough!!" Energise your obedience - this workshop is aimed at putting the zing back into your obedience with lots of excercises to make your training a bit more interesting. 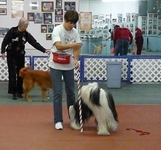 Especailly useful for Beginners / novice level but also a good reminder course for handlers in higher classes. Take the class - Teaching other people is not easy so this day workshop is aimed at improving your teaching skills. From class control to constructing a good class are items that will be covered plus of course how to deal with those more testing of pupils !! Workshops in other countries do need to be booked well in advanced. Perhaps you need some help with a routine or just need guidance on how to get started. A one to one lesson is basically guided by you so feel free to do whatever you feel you need work on.